I went along to Jordanhill School, Glasgow, this evening to attend a 'forum' hosted by John Sharkey, who is currently working for the SQA, developing the new Higher and Advanced Higher Physics courses. 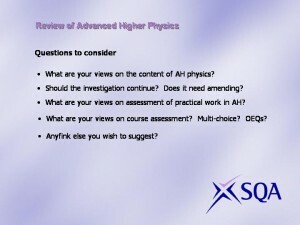 Having the same unit names as New Higher, whilst giving a sense of developing upon the content in that course, might also imply that the new AH course is 'more of the same' - there were concerns that this might lead to pressure on centres with smaller cohorts to have bi-level teaching of new Higher and new Advanced Higher classes. One of the most pressing issues, mentioned by all of those present, was that of the obvious need for high quality CPD, including exemplar materials and ongoing support to familiarise teachers with new content, and offer guidance in the development and delivery of the new course. The SQA are intending to run a number of similar 'forum' meetings to continue to canvass opinions from teachers, whose responses will be used to inform the consultation documents for the new Advanced Higher course released in 2011. 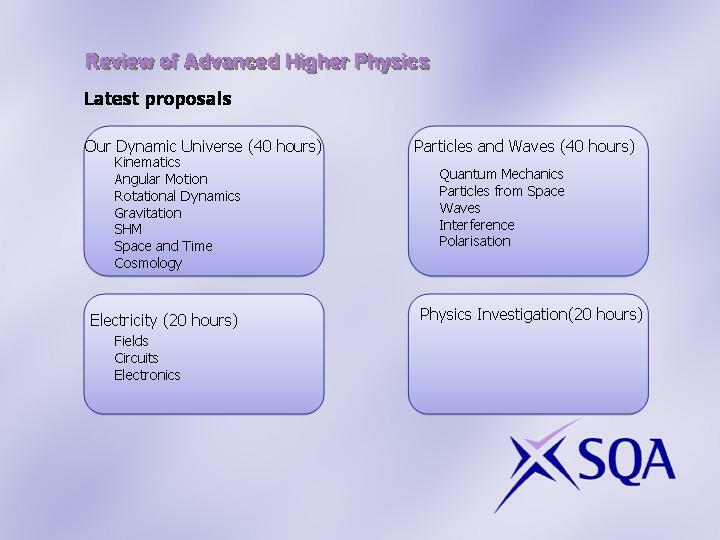 As for the new Higher, consultation will take place via the SQA Academy.